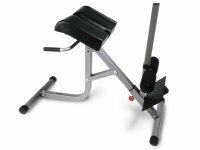 The BodyCraft F670 Hyperextension adjusts from a 0 degree flat position, to a 25 degree position, to a 45 degree position. A machine for all size users and all preferred styles! Extra wide, injection molded pad is comfortable for both men and women. 2" x 2" square, 12 gauge steel construction. Lifetime home warranty. Since it is built to last a lifetime, every part of the BodyCraft F670 is guaranteed for as long as you own it. We will replace or repair any defect. Warranty applies only to the original owner and for in-home use. Does not cover wear and tear.